Zoom to selected map extents? This application allows you to search for all of our online maps by their place/location. Use both 1. Select a category: and 2. Select a map / map series:. The map extents are shown as bounding boxes. Zoom in on your area of interest and click on it to view the map that covers this area. The extents of the map that you have selected is highlighted in blue, and a brief record and image of it appears in the right-hand panel. Select this record or image in the right-hand panel to view a zoomable image or further information about the map sheet. Use the Search Gazetteer to position the map location on a particular place name. National Grid References (4, 6 or 8 figure) can also be input and the map will move to this location. You can also position the map by choosing particular counties and parishes from drop-down lists. 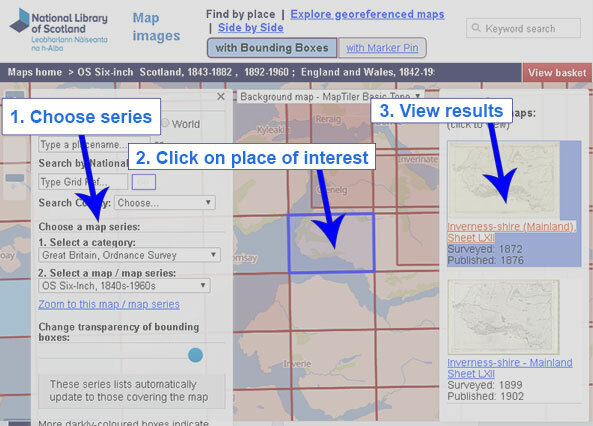 Under Choose a map series, select Multiple categories / group search to search for all the map series, or for groups of series, covering a place. (drag cursor) to zoom to a specific area.